Vinyl siding has come a long way since it was first introduced as an inexpensive option for siding your home. Today, it is available in many colors and numerous styles. And while it is still fairly inexpensive, it no longer has the look of an inexpensive product. Vinyl siding has always been suitable for various climates, but its original thin gauge made it prone to waviness in hot weather, and susceptible to cracking in cold temperatures. The types of vinyl siding available today have addressed the potential shortcomings of the first generation of vinyl siding. You can choose from many looks and feel confident about the quality of the product you'll likely have displayed on the exterior of your home for many years. Vinyl siding is manufactured in various thicknesses, or gauges. If your home is exposed to long periods of below-freezing or above-90-degree temperatures, a heavier gauge vinyl is recommended. A thicker siding can also withstand higher winds, which is a consideration in some parts of the country.Manufacturers have been successful in getting some of their heavy gauge vinyl siding approved for use by the Miami/Dade County Building Department, which only approves building products able to withstand high winds. Many of the heavy gauge vinyl sidings have also received certification from the Vinyl Siding Institute. 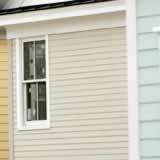 Another excellent feature on some varieties of today's vinyl siding is attached insulation. Again, homes that experience extreme weather conditions can benefit greatly from this practical enhancement.